The Food Network is a TV station which I'm convinced has magical and captivating powers. No matter what show is on it leaves me completely hooked. It's very impressive to watch someone finely dice or chop a tomato with ease while my knife skills look like a small child's. I love to watch the chefs or cooks create fabulous mouth watering meals and desserts that I would gladly gobble up in five seconds flat. Has anyone figured out a way to take a fork to the TV screen successfully yet? Please alert me when that happens. If you haven't tuned into a Food Network TV show lately, you should really do so today. From Scratch: The Uncensored History of The Food Network is the first book about the network that covers the whole story from the beginning. 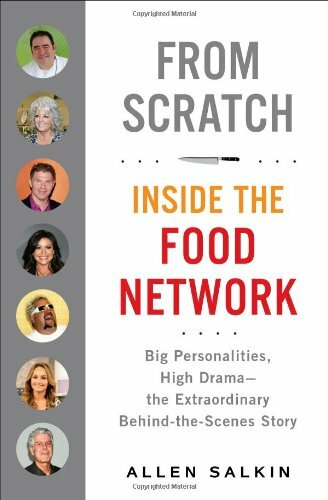 It includes a brand new afterword with behind the scenes information about your favorite Food Network personalities. How about learning of a bullying Robert Irvine as he confronts a rising rival, or Paula Deen trying to rebuild her brand against all odds? So many Food Network names are covered in the book including The Pioneer Woman, Ree Drummond, as she struggles to adapt to being a TV star. Illuminating one of the most notable cultural and media trends of recent decades, the rise of a food-obsessed culture, the book also tells a powerful business story. Turn the pages to discover how creativity, chance, technology, and money sometimes work together when building a brand. -A hedge fund billionaire paid Guy Fieri $100,000 to be his friend for the day. -Paula Deen's agent pushed and cursed the president of the network to give her a shot after a programming executive who was biased against Southerners kept rejecting her. This would make a fantastic Christmas present for yourself, or any other Food Network fan. Let the book answer all of your burning questions about the network. There will surely be some secrets and surprises on each page. I like any show that Alton Brown is on-Iron Chef especially and also their competition shows are fun like Chopped. I like watching the Next Food Network Star competition. I love The Pioneer Woman! Pioneer Woman is my favorite! I love the Barefoot Contessa show. chopped is my favorite show on the food network. I love Ina Garten, and the show Barefoot Contessa!! My favorite show is Chopped. I never miss an episode.